Wyoming has eight institutions of higher education that offer degrees and programs in criminal justice. In addition to these on-site options, students may also consider online programs through these or other institutions, especially if they are in a rural area. Once a student has determined that they have an interest in the field, there are many other things to consider before beginning a degree or certificate program. Sorting through possible careers, earning potential, and education requirements should be the priority. Potential students can use this web site as a starting point for their research. They can search school options, learn about actual careers and corresponding salaries in Wyoming, and get access to additional resources to aid in their research. After Criminal Justice School in Wyoming: What's Next? Which of Wyoming’s criminal justice programs is the best? The answer to that question will depend on each person’s individual concerns; however, we’ve ranked them here according to useful criteria to help students decipher some from others. Tuition costs, enrollment, class size, and acceptance rates are all considered in the ranking below. 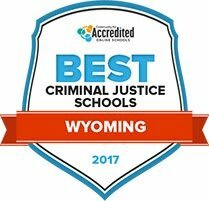 Check out 2017's best criminal justice schools and programs in Wyoming below. Several different criminal justice degree programs are offered at Eastern Wyoming College (EWC). The criminal justice associate of arts degree program is available completely online. An associate of applied science degree in criminal justice is also offered at EWC. Students may also choose to pursue a criminal justice certificate. The two-year associate of applied science degree requires a variety of coursework, including psychology and physical fitness. EWC's certificate in criminal justice program is a year long and requires completion of a minimum of 30 credits. Financial assistance and scholarships are available for eligible students at EWC. The criminal justice department at Casper College offers an associate of applied science degree program and associate of arts degree program. Both programs require that students complete a minimum of 60 credit-hours. The curriculum in each program include general education courses as well as physical fitness and communications. Casper College uses the learning management system Moodle for all courses. Casper College is a part of the WICHE and WUE scholarship program available to students in 15 different western states. FAFSA financial aid and other grants and scholarships are available to students at Casper College. Associate of arts degrees in both law enforcement and corrections/pre-law are offered at Laramie County Community College (LCCC). LCCC's two-year criminal justice program requires that students select a specialization prior to the second year. In order to receive the associate of art degree, students in the program will take a variety of classes along with the necessary general education courses. Credits earned in LCCC's criminal justice program are transferable to several four-year colleges. Financial aid, scholarships and grants are available to eligible students at LCCC. Desire2Learn is the course management system used throughout LCCC. Students at LCCC may submit assignments through Desire2Learn. After completion of general education courses, students at Central Wyoming College (CWC) may choose to pursue an associate of arts degree in criminal justice. CWC emphasizes that criminal justice is an interdisciplinary field by including courses related to political science and communications, among others. Students are required to complete a minimum of 60 credit-hours in order to apply for graduation and receive an associate of arts degree at CWC. Student support services that include tutoring and counseling are available to students at CWC. Eligible students may receive financial aid at CWC, and students may choose to apply for scholarships as well. Those interested in studying a career as a criminal justice professional may benefit from enrolling in the criminal justice program at Northwest College. Located in Powell, Wyoming, this school aims to create a student-centered learning environment by supporting their community of students through high quality instruction and providing beneficial opportunities for student advancement. Through the criminal justice program at NWC, students can study to someday become a professional in the field with roles like probation officer, criminal attorney or crime scene investigator. With several branch campuses and learning centers located throughout the state, the University of Wyoming gives criminal justice students versatile options for completing their degree. A bachelor of arts degree in criminal justice can be completed through the Laramie and Casper campuses in addition to locations through UW's outreach school. The BA program requires 120 credit hours of which 39 are considered core criminal justice classes. Additionally, students can transfer an associate degree as part of a ñtwo plus twoî program to complete the bachelor in criminal justice. Specializations can be obtained in law enforcement, corrections and pre-law. At this point in the research, students may have an idea of a school and career that holds interest for them. In addition, they also need to consider what those careers’ earning potential is, what competition level there is for those jobs, and what educational requirement is necessary for them. The data below is designed to give students a clear idea of what to expect from careers that interest them. In the tables below, prospective applicants can further explore careers in the criminal justice field. In searching for careers, it’s interesting to note what the annual salary is, how it compares to the national average, and the educational degree required. The second table also lists projected growth for potential careers, both in Wyoming and nationally. It’s important to understand that the listed degree level required is a minimum suggestion; for many highly competitive jobs, students may consider completing a higher level than is suggested. To gain an even clearer understanding of possible careers specific to Wyoming, potential criminal justice students can examine the table below. What are the main locations in Wyoming to find these jobs, and in which sectors? Plus, what do they make? Researchers can explore the data below to see what jobs are specific to the state, how many people hold those types of jobs, and where one might be able to find availability. Information on federal OSHA compliance stipulations, employment and training, and news and resources. This is a state-run agency that works to bridge human and economic development for the state’s future. A non-profit organization that represents 200 businesses and economic members in Wyoming. Also provides resources for businesses as they start and ensures proper compliance with city and state regulations. The primary source of information for compliance for new businesses, businesses changing entity types, or businesses moving into the state. Also includes policy information and news updates. The Wyoming State Chamber of Commerce advocates for businesses in politics and provides educational and networking resources for the community. This chapter of the ACC, which includes Wyoming, provides resources for corporate legal professionals, including continuing education, events and networking opportunities. The SBA offers information on businesses loans and grants as well as how to start and manage a business. Includes job posting information, report cards on institutions, and community involvement. DOC also supports volunteer activities and details policies for offenders and staff members. Students of criminal justice should familiarize themselves with parole policies. This web site also includes an offender locator, hearing schedules, and a victim services outlet. This webpage contains information from the State Advisory Council on Juvenile Justice, including resources about law enforcement, the judicial system and youth resources as well as information for families. Visitors to this site can sign a petition to enact reform for shorter sentences for prisoners who exhibit good behavior and for the governor to make greater use of the ability to issue commutations. A source for careers, internships, and additional resources, this web page will be helpful for potential law or criminal justice students. This site lists all of the state’s courts as well as updated information on open job positions within them. The WPCRA provides membership-based continuing education and networking opportunities to the state’s court reporters. The Wyoming chapter of the Court Appointed Special Advocates group provides non-profit advocacy for children who were abused or neglected and places them permanent, safe homes. The Wyoming ACLU chapter seeks to promote a fair criminal justice system by enacting reasonable sentencing and fighting against government abuses of authority. The Wyoming State Bar provides testing information for attorney licensing as well as resources for current lawyers. This membership-based association provides seminars, resources and other continuing education for legal assistants in the state of Wyoming. Legal Aid of Wyoming provides non-profit legal services for civil cases to low-income individuals across the state. Funded by the state, Equal Justice Wyoming provides civil legal services for citizens in Wyoming who have limited incomes. This program helps determine and enforce child support requirements in the state of Wyoming. The Wyoming Attorney General offers legal protection for consumers and provides legal counsel and representation to state employees and entities. Job postings, training opportunities, and continuing education for law enforcement and public safety officials. WASCOP represents its members at state, local, and federal levels through its members’ activity in state legislature, boards and committees, and charitable organizations. It has job postings, reports and resources, and projects to keep its members learning and involved. All of the state’s job posting and positions are here, including those for law enforcement. The state of Wyoming has its own DCI, which has 36 Special Agents throughout the state. A member-based organization, the WPOA offers its members a death benefit, insurance, and a network of other professionals. It also advocates for police officers, correctional officers, game wardens, and many other kinds of professionals for state legislation specific to them. The Wyoming Highway Patrol Association is a non-profit organization that supports and provides resources for state troopers. For information on everything outdoors, from hunting and boating to fishing and public access, this site has law enforcement career links and resources, a member-based function, and further training and education. Updated news regarding Wyoming’s parks, including activities for adults and kids, events, and volunteer and job opportunities. A group formed through the Governor’s office, the nine members of this board come from different backgrounds to ensure cooperative approaches to maintaining wildlife and resources. There are volunteer projects with which to get involved, and additional resources available. Wyoming Game and Fish Department law enforcement officers, retired officers and associate members can join this membership-based group to promote communication and camaraderie with other officers throughout the state.